Before midnight the sky was clear and Moon was bright. There was plenty enough snow on the ground to let Moon light up the landscape. It would have been a beautiful night to go out with camera and tripod… except that the temperature was 14 degrees (F). Call me timid but that's cold. This morning She Who Must Be Obeyed pointed out the patio door to the balcony asking, "doesn't that look like a cat?" 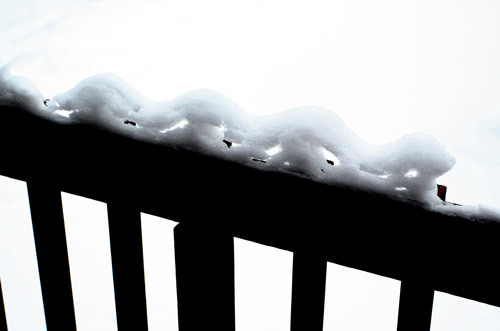 The wind and other local forces had made an interesting shape out of snow that had settled on the balcony's wooden railing. Sure does look like a cat's head in profile, "with its ears back," said I. Grabbing my trusty "old" camera I opened the door and squeezed off a few shots of the snow sculpture. Then I noticed another shape, a little farther to the left of the cat bust. A snake (or dragon)! All the while the real cat of the house regarded my activities with curiosity, though not enough to draw her out into the still-frigid air and snow-covered deck. Smart cat, that; more interested in people and birds than snowshapes. 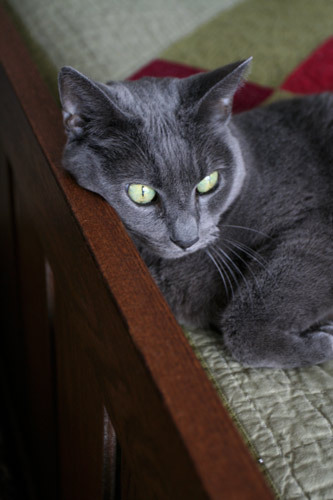 I love the SnowSnake – and I think Tasha has the right idea!! Haa! And cuddling indoors with a blanket like our cats. 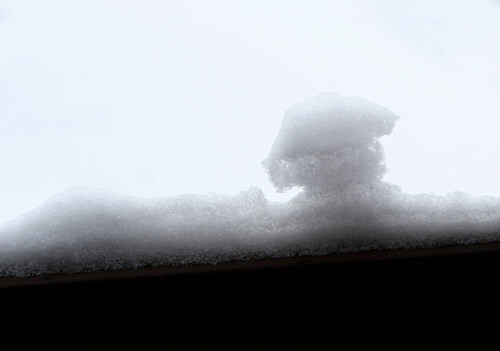 Lovely snowshapes! It's been hoovering around single digits F here but that's without the windchill. Brrrrrr. Wonderful photos! I especially like the snow cat!